In the first race since it was announced that Yamalube/Star Racing Yamaha’s Cooper Webb will be joining Chad Reed on the factory Yamaha 450cc racing team in 2017, Webb showed that his imminent graduation isn’t slowing him down. With six motos left in Webb’s 250cc career, he came into Unadilla, round 10 of the Lucas Oil AMA Motocross Championship, on August 13, knowing this will be his last chance at winning a 250cc National MX title, and it showed. Webb came into Unadilla up by 51 points – more than one full race – over his teammate and reigning champ Jeremy Martin, with Monster Energy/Pro Circuit Kawasaki’s Joey Savatgy just two points farther behind in third, but just prior to Unadilla, Martin announced he was dropping out of the championship with fractured ribs suffered in the Webb/Savatgy/Martin/Cianciarulo tangle-up early in moto two at Washougal, which meant that Webb’s point lead was effectively 53 over Savatgy. Savatgy could not afford to let Webb beat him at all at Unadilla, but it wasn’t entirely up to him. In moto one, Savatgy’s teammate, rookie Austin Forkner, snatched the holeshot over his teammates Savatgy and Cianciarulo, then came Troy Lee Designs/Red Bull KTM’s Mitch Oldenburg, Webb’s teammate Alex Martin, and then Webb. Martin got by Oldenburg right away, and Webb followed suit before making a pass stick on Martin for fourth a lap later when Martin got hung up in a rutted corner. Webb quickly narrowed the gap to the top three, as Forkner continued to lead Savatgy and Cianciarulo. Webb got Cianciarulo in “Screw U” (the steep, off-camber 180-degree left turn just prior to the racers crossing the first turn in the front section of the track) when Cianciarulo went wide, and just as Webb began working on Savatgy, less than 10 minutes into the race, the red flag flew for privateer Coty Schock, who had fallen. On the restart, Cianciarulo got the holeshot over Webb, and then Kawasaki teammates Arnaud Tonus and Savatgy, while Forkner was mired in the pack. The situation got worse for Forkner when Martin went down in front of him only four turns into the race, hanging Forkner in one spot while the pack screamed by. 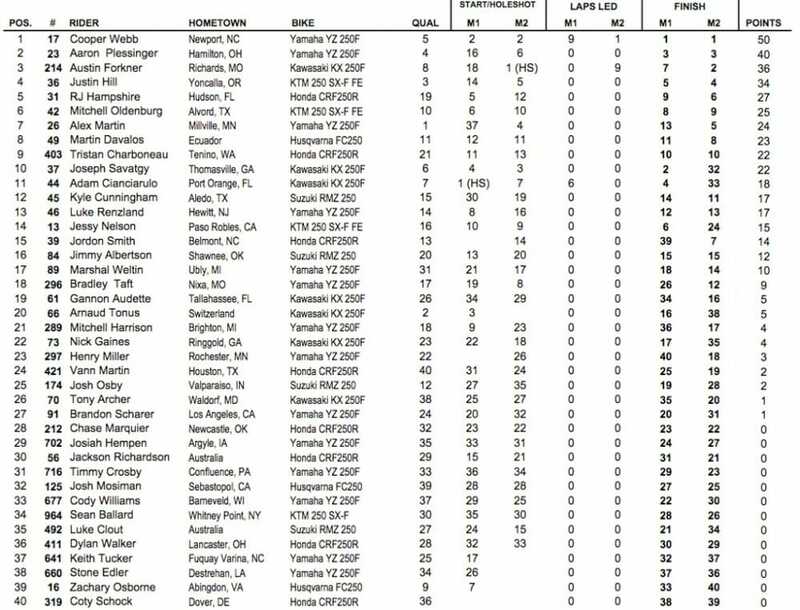 Forkner got going in 19th, while Martin was 37th. Cianciarulo finally gave way to Webb at around the halfway point after he looked back at Webb in the air over the preceding jump. It wasn’t long before Savatgy not only made a pass on Tonus for third, but also got around his other teammate Cianciarulo for second, but by that point, Webb was gone. Just when it seemed as if the top three were set, something lit a fire under Webb’s teammate Aaron Plessinger. With three laps to go, Plessinger’s laptimes were five seconds faster than Webb out front, and he quickly closed on Savatgy in second. He made a move for second with two to go, but was balked by a lapper in Screw U, allowing Savatgy back by. Savatgy dug deep and managed to hold Plessinger off until the finish. Savatgy still lost 3 points to Webb in the moto, putting Webb up by 56 with only five motos left to run. In moto two, Forkner again snatched the holeshot with Savatgy, Webb, Plessinger, Martin and TLD KTM’s Justin Hill giving chase. Martin got by Plessinger in the early going as Plessinger was trying to get up to speed, and went after Webb. At the same time, Webb was working on Savatgy and Savatgy was doing everything he could to block Webb’s progress. But Savatgy ended up swapping off the track before Screw U, and although he didn’t go down, it was all Webb needed to sneak into second. Savatgy then seemed to move his focus to the racers behind him, as he spent his time blocking Martin for a couple of laps before Martin found his way by in the back, and things began to fall apart for Savatgy. That same lap, Plessinger got Savatgy going into Screw U, and then Hill and privateer Yamaha pilot Bradley Taft also went around Savatgy. Only a few laps later, Savatgy had faded to 17th, then pulled off, citing heat exhaustion. His teammate Cianciarulo had already pulled off for the same reason earlier in the moto. Martin ended up going down while running third, behind Webb, at about the 20-minute point, which pushed him back to fifth place and handed third to Plessinger. Just after that, Webb made a push to get around Forkner, and he succeeded officially with six minutes to go in the moto – and just in time, because out came the day’s second red flag for TLD KTM’s Jessy Nelson, who had gone down. With the race past the 20-minute mark, it was called, and Webb took the win over Forkner, Plessinger, Hill, Martin, GEICO Honda’s RJ Hampshire and Jordon Smith, Rockstar Energy Husqvarna’s Martin Davalos, Oldenburg, GEICO’s Tristan Charboneau, MotorcycleSuperstore.com Suzuki’s Kyle Cunningham, and privateer Taft finishing a strong 12th in the incredibly deep 250cc field. Other side notes, Chase Sexton, the AMA Horizon Award winner last week at Loretta Lynn’s, did not make his pro debut as was expected. A knee injury prevented him from riding but he might be back on the track soon. 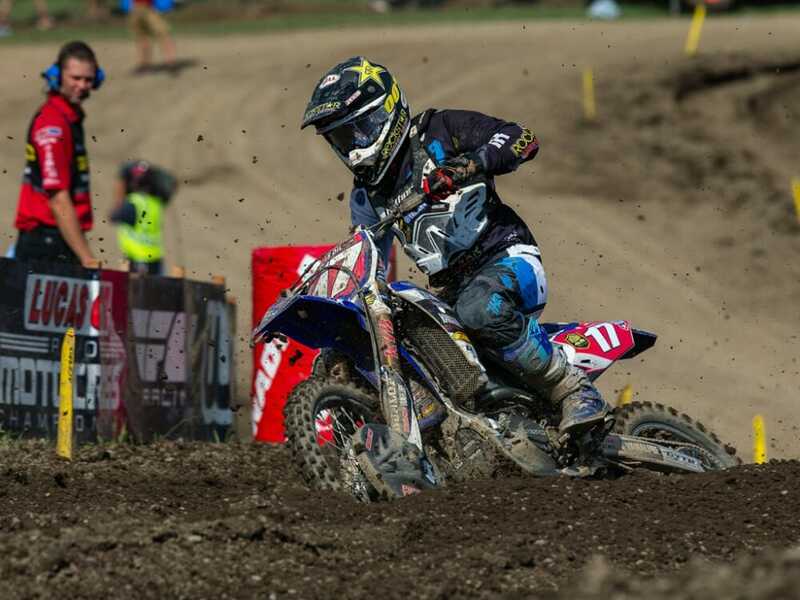 Bradley Taft, however, made his debut and finished 18th overall, which included a 12th in the second moto. With only four motos left to run, Webb now carries a massive 81-point lead in the championship, which means that all he has to do is finish in the top three in moto one at Budds Creek to clinch the championship. If he can’t manage that, all he has to do is not lose more than 31 points to either Savatgy or Martin (who are now tied for second in points) at Budds Creek, and he will be the 2016 AMA 250cc MX National Champion. Round 11 will be held at Budds Creek Raceway in Budds Creek, Maryland, next Saturday, August 20th.